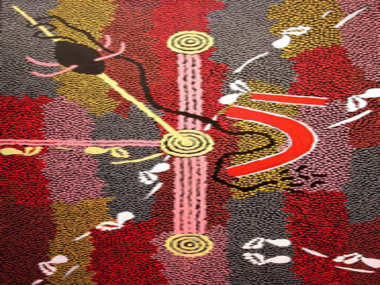 Like stated in the powerpoints, Aboriginal paintings are considered maps. This map has myth of the formation but it can also be portraying the physical land and objects within it. Songlines in the map are shown, which are used when passing through the land or through the land of another tribe. Some of the songlines are the same between tribes, but many differ as well. Landscape features, animals and plants, and formation myths are all put together in creating songlines.